Dr.Lana Rozenberg supports National Dental Hygiene Month by providing insight on the relationship between orthodontics and oral health. Proper care allows patients to maintain proper hygiene routines and prevent further oral health conditions. Your dental health and smile are very important to your daily life and how you feel about yourself. We can help you to feel confident and happy with the look of your smile, and our Manhattan Dental Spa will put you at ease when you come to visit. Dr. Lana Rozenberg, an accomplished dentist, honors National Dental Hygiene Month by educating patients how proper dental technology can lead to improved oral health. Patients who have trouble caring for their teeth due to crowding are encouraged to receive Invisalign clear braces to improve their oral health and appearance. 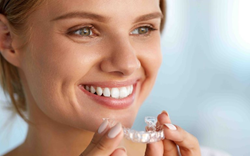 Patients who want to fix their smiles should receive a consultation from Dr. Rozenberg,and find out if Invisalign aligners are a viable option for them. Crowded teeth can overlap and become crooked making it difficult to care for them. Plaque can become trapped between crowded teeth and lead to tooth decay or gum disease. When dealing with traditional metal braces or orthodontics, certain measures may need to be taken to ensure that the teeth are adequately cleaned. The metal parts can make it challenging for patients to floss and brush all surfaces. Dr. Rozenberg offers Invisalign treatment, which gets rid of this common problem by allowing patients to remove them each time they need to brush or floss. This makes it much easier for patients to keep their teeth clean and healthy while they receive orthodontic treatments. It is also important to note that this option is more comfortable than traditional braces because they do not require metal components that can harm the sensitive inner lips and cheeks. Dr. Lana Rozenberg and her world renowned Manhattan dental practice truly offer the epitome of excellence. A rare combination of comfort and quality, this is why she is often referred as the best dentist in NYC. Trusted not only by the local residents of Manhattan and surrounding boroughs, but by patients throughout the country including top A-List celebrities. As one of New York’s top cosmetic dentists, Dr. Lana Rozenberg, loves creating beautiful smiles. Through her passion, experience, and expanded knowledge, she has helped hundreds of people improve their dental health. To learn more about Dr. Rozenberg, or the services she offers, please visit her website at https://rozenbergdentalnyc.com or call (212) 265-77-24 to schedule an appointment.